Emilie-Claire Barlow is a Juno Award and National Jazz Award winning vocalist from Toronto, Canada. She has released nine albums over the past 15 years, racking up multiple awards and nominations, including 5 Juno nominations, A Gemini nomination, and winner of the National Jazz Award for Female Vocalist of the Year in 2008. 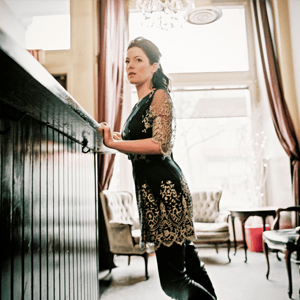 Her 2012 studio release, Seule ce soir took home the Juno Award for Vocal Jazz Album of the Year as well as the Felix Award (ADISQ) for Best Jazz interpretation in 2013. In 2014, she released her first live album, Live in Tokyo, recorded at the famous Cotton Club in Japan. Her new album is slated for release next October. Her energetic live performances and exquisite recordings thrill sold out audiences from Tokyo to Montreal. Emilie-Claire leads her stellar band through innovative arrangements of American-Songbook treasures, rhythmic bossa novas, and elegant ballads. She continues to endear herself to critics, peers, and audiences everywhere, with her relaxed, polished demeanour, her charming humour, and a voice of unforgettable beauty. Emilie-Claire is also a busy voice actress, lending her voice to hundreds of jingles and voice overs over the past 25 years. Animation credits include Almost Naked Animals, Fugget About It, Total Drama, Stoked, 6Teen, Bakugan Battle Brawlers, Monster Math Squad, Rescue Heroes, Z-Squad, Martin Mystery, Totally Spies.